* Visit your local book stores, libraries and www.amazon.com to keep updated on the latest canine knowledge. We are aware of the negative effects of second hand smoke on our own health. But how many of us have really thought about the effects on our pet animals. Practicing veterinarians have often observed individual cases in which a dog or cat’s respiratory problems such as asthma or chronic coughing have been dramatically improved after their exposure to second hand smoke has stopped. Although the research is still somewhat sparse, evidence is accumulating about the adverse effects of tobacco smoke on animals. One study, conducted at Colorado State University’s Veterinary Teaching Hospital, looked at the correlation between second hand smoke and the incidence of lung and nasal cancer in dogs. It showed that a dog exposed to smoke is 1.6 times as likely to develop cancer, and suggested that the shape of the dog’s nose had an influence on the site of cancer – dogs with long noses were more likely to get nasal cancer while those with short noses were more prone to lung cancer. Another study, conducted at the University of Massachusetts and Tufts University School of Veterinary Medicine linked malignant lymphoma in cats to passive smoke exposure, showed that cats living with smokers were 2.4 times as likely to develop lymphoma than cats living in smoke-free homes. The risk was found to increase with both the amount and number of years of smoke exposure. There are no published animal studies yet on the effects of smoke on allergies, asthma or heart disease. Since many of these conditions have multiple inciting factors, it can be difficult to unequivocally prove a cause and effect relationship. But given the small amount of research that is available, it would be prudent for pet owners to avoid the risks by eliminating second hand smoke in the pet’s environment. the gateway to power. " Each of us can become an empowered PON parent if we so wish. 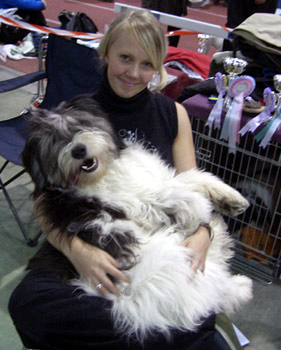 Become active in your respective breed club and participate in activities and committees. Good luck.